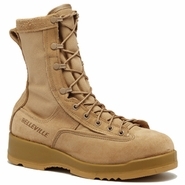 Belleville manufactures many models of Air Force boots for all types of different environments. Their basic hot weather models are the 600 and 600 ST which feature unlined liners to keep your feet cool and rugged VIBRAM outsoles for longevity. The 610 and 610 ST models step up to Belleville's patented Merimax midsole which lightens up the boot without compromising comfort. These models are more suited for physical activity. 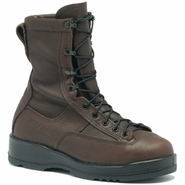 The 610Z features a combat side zipper for airmen who need footwear with easy removal. The 639Z CT adds composite toe protection for soldiers working in hazardous environments with falling objects or electrical hazards. The 630 ST Maintainer series was designed for flight line maintenance personnel and features smooth leather for quick and easy cleanup as well as a tough steel toe. It features tough rubber heel and toe overlays for protection from gouges and scuffs. The 633 is the latest tactical Air Force model designed for patrol duty in uneven or rugger terrain. Belleville also manufactures several cold weather models as well. The entry level 650 features a waterproof Gore-Tex bootie to keep your feet dry in cold, wet weather. The 615 employs the lightweight Merimax midsole combined with waterproofing for a cold weather, athletic boot. 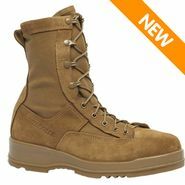 The 690 is a USAF Flight Approved boot with Gore-Tex technology. The 695 adds 200 grams of Thinsulate insulation for airmen operating in colder weather. The 680 ST is the cold weather Maintainer boot. The 675 is their most insulated boot with a full 600 grams of Thinsulate warmth protection.